Climate-KIC has nominated six innovators for the 2015 EIT Awards of the European Institute of Innovation & Technology (EIT). The winners will be announced at INNOVEIT 2015 in Budapest, Hungary, on 6 May. The EIT Awards promote the most promising European innovations. The awards put the spotlight on innovators and entrepreneurs involved in the EIT’s Knowledge and Innovation Communities, known as KICs. “We are expecting a global deal on greenhouse gas emissions at COP21 in December. Our nominations for the EIT Awards are already contributing to the implementation of this agreement. They provide scalable solutions to reduce emissions and are creating sustainable growth for Europe’s economy,” said Bertrand van Ee, CEO of Climate-KIC. 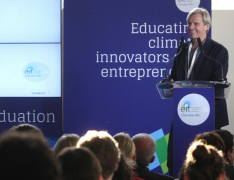 “The EIT Awards are a fantastic opportunity to demonstrate the emerging business case for climate innovation. Businesses and innovators across Europe working together in Climate-KIC are already bringing their solutions to market,” he said. For the EIT Venture Award, which puts the spotlight on entrepreneurial start-ups, Climate-KIC nominated Regnar Paaske of Nordic Power Converters (Denmark) and Hidde-Jan Lemstra of Reduse (United Kingdom). Nordic Power Converters, based in Lyngby, found a way of increasing the power of electric converters for LED, chargers and other applications. Cambridge-based Reduse has developed what it calls an ‘unprinting’ technique that uses a laser to remove print from paper. This year’s edition of the EIT Awards introduces the EIT Innovators Award as a new category. This award recognises innovation teams that have developed an innovative product, service or process in an exemplary manner with a high potential impact on society and economy. For this new category Climate-KIC has nominated Sander de Vries of Biogas ETC (the Netherlands) and Renate Schubert of Off4firms (Switzerland). Biogas ETC – Energising the Countryside – enables small-scale biogas production. Off4firms supports employer-led initiatives to reduce CO2 and energy through the households of their employees. Climate-KIC also nominated Jelmer van Veen of Dutch AQGRI+ and Arno Zimmerman of Coolar for the C.H.A.N.G.E category in the EIT Awards. This category recognises ideas of young graduates from EIT education and training programmes. AQGRI+ has developed a system to turn wastewater into a resource. Coolar is developing the Coolar Fridge, a non-toxic, climate-friendly fridge that runs on low-cost heat.